I am very happy to be able to say that I ran 26.2 miles! After all the training, the build-up, the sensible eating (and all the chocolate eating) the big day arrived last Sunday, and boy weren't we lucky with the weather? I managed to get a good nights sleep and woke up surprisingly calm. As usual, TFL and the actual train companies seemed unable to communicate with each other so the trains that the Internet told me would be running weren't running, but even that turned out ok. I have to thank Sheena Patel, a complete stranger but fellow runner who picked me up from the bus stop and dropped me off at the tube station. There did seem to be a something in the air, an excitement that everybody was feeling, and it made London feel nice! We had all been given red bags to put our stuff in whilst we ran, and as my journey to Greenwich progressed there were more and more red bags. It was like a flash mob was forming, a huge group of 37,500 runners! As I stood waiting to start I wasn't nervous, it actually felt unreal. Here I was, about to tackle the challenge of a lifetime but it also felt like a great day out too! It took over ten minutes of walking to reach the actual start and then we were on our way, and people were shouting out my name already! The first 10 miles went by so quickly that I was starting to think that it may be easy (hmmm!) I had a huge team of supporters waiting for me at the 12 mile mark and it was great to see them all, waving orange streamers and pom-poms! One of the highlights was crossing Tower Bridge and I felt so proud that it actually gave me goosebumps. I missed seeing my supporters in Canary Wharf as they were having lunch (!) but things continued to go well...up until mile 18. I stopped to go to the loo (there are portaloos throughout the course, in case you were wondering) and it was so hard to get going again. My legs felt like they belonged to someone else! Once I got back into my stride they felt ok, almost as if they were on autopilot. I decided then I wouldn't be stopping for anything until I'd crossed the finish line! I don't think I actually hit a 'wall' but it was definitely tough going between 18 and 22 miles. I remember clearly the sign that said "in 2.5 miles you will have finished" and that really spurred me on. By this stage there were lots of people walking but my legs just kept on running. 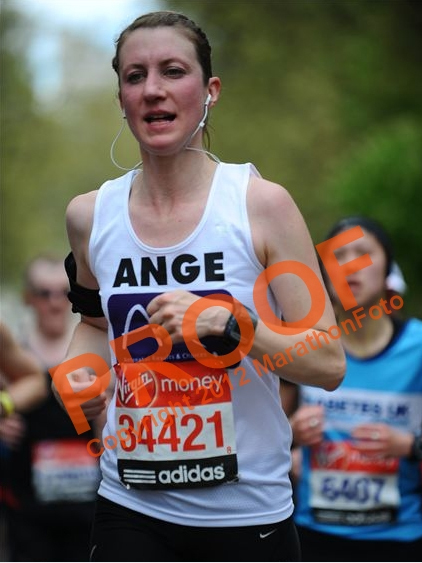 My husband was at the 25 mile mark, and my mum, brother and friends were at the '300m to go' sign. It was such an amazing feeling to see them (screaming their hearts out along with everyone around them!) and then turn the corner and see the finish line. Out of nowhere I got the energy to speed up and sprint for the finish! 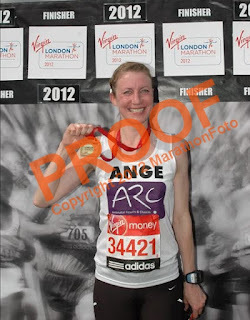 I'm not sure if I'm smiling or grimacing in this finishers photo but I was very happy to have my medal! My official time is 4 hours 30 minutes and 40 seconds, which placed me in 18782nd place overall. I'm pretty happy with that. I want to say a huge thank you to everyone that supported me throughout this massive achievement - all my friends and family, my colleagues, twitterfolk and bloggers but also the hundreds of people who helped to organise and run the event and especially the thousands of people that turned out to cheer us all on. You have no idea how much it helped every runner to see you all lining the entire route. I felt like a superstar! I've been asked many times this week if I'd run a marathon again........ and the answer is yes! It wasn't as hard as I'd imagined that it might be, and the worst 'injury' I had was sunburned shoulders. However, that said I won't be signing up to another one just yet. The training did take up a huge chunk of time especially at the weekends and I think that my family and friends might want to see a bit more of me now. I do hope that some of you have been inspired though and maybe I can pass the baton on? 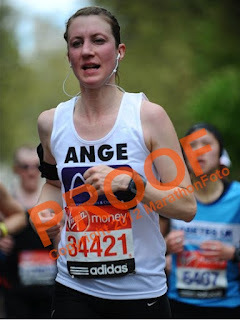 There are loads of races of all distances that you could take part in, but if you do fancy London in 2013, the Ballot opens on Monday 30th April. Good luck! I can't write a post about this marathon without expressing my sympathy to the family of Claire Squires. She seems to have been an inspirational woman, and it's so sad that her life ended too soon. The money that has been donated in her name to the Samaritans will help many, many people and keep her memory alive. Rest in Peace. Thank you for your comments! I have had a rest but I'm itching to get out there again - but a more modest distance I think! It's great to tick it off my list!